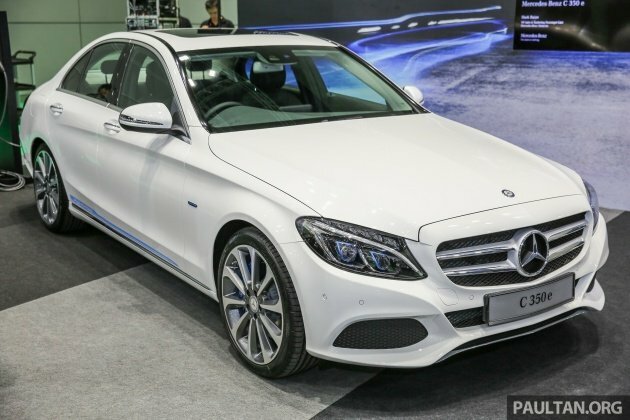 Mercedes-Benz Malaysia has introduced its latest W205 Mercedes-Benz C-Class variant, the C 350 e plug-in hybrid, in the country. The locally-assembled car – which was previewed in August – was officially launched today, and arrives in three trim forms. The range starts with the C 350 e Avantgarde, followed by the Avantgarde (with AMG Line interior), topping out with the AMG Line variant. Pricing starts at RM289,888 for the Avantgarde (as pictured here), with a RM5k jump for each subsequent model – RM294,888 for the Avantgarde (with AMG Line interior) and RM299,888 for the AMG Line variant. 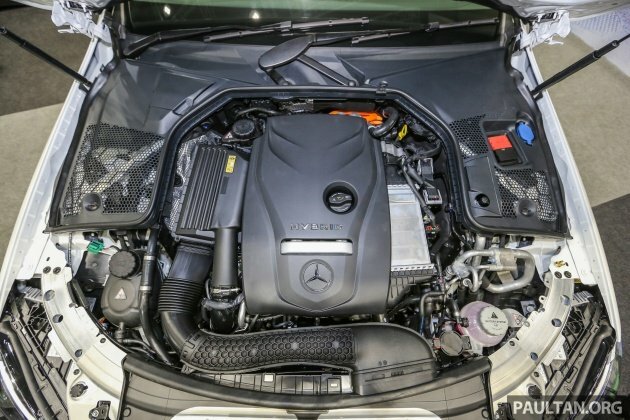 The car is powered by the familiar M274 DE 20 AL 2.0 litre turbocharged four-cylinder mill as seen on the likes of the C 250, and it runs the same output tune as well, making 208 hp and 350 Nm of torque. Providing additional power is an 80 hp/340 Nm electric motor sandwiched between the engine and the 7G-Tronic Plus seven-speed automatic transmission, resulting in a total system output of 275 hp (the official communication lists the number as 279, but this is in PS) and 600 Nm. The high-voltage lithium-ion battery has a total capacity of 6.2 kWh, and is located at the rear of the car. This reduces the boot space from 475 litres in the regular W205 to 335 litres in this one, which is still very usable in terms of volume. The 100 kg water-cooled battery is mounted in a sheet steel housing underneath the rear axle in order to maximise crash safety, driving dynamics and boot space. Performance numbers include a 0-100 km/h time of just 5.9 seconds, while combined fuel consumption is rated at 2.1 litres per 100 km on the European NEDC cycle. The car has an all-electric range of 31 km, with a maximum speed of 130 km/h in this mode. Carbon dioxide emissions sit at just 48 grammes per kilometre. The battery be recharged in around one hour and 45 minutes via a wallbox or a 230 volt/16 ampere 3.7 kW single-phase public charge point. If a domestic power socket is utilised, the charge time is around two hours via a 230 volt/13 ampere 3.0 kW single-phase supply. The charging port, a SAE J1772 connector, is located on the right side of the rear bumper. Standard kit across the range includes an Airmatic air suspension, Thermotronic three-zone automatic climate control with a climate pre-conditioning system; the latter allows a user to programme the climate control to turn on at a preset time, making it possible to set a desired temperature before a journey. Also on, a 590-watt, 13-speaker Burmester surround sound system. The Avantgarde features a regular sunroof, an Audio 20 system with a 7.0-inch central display screen and 10-spoke 19-inch alloys, while the Avantgarde (with AMG Line interior) and the AMG Line variant ups the sunroof to a panoramic unit and bumps up the infotainment system to a COMAND Online with an 8.4-inch display. Both upper models also feature a 360-degree Surround View camera and ride on the same 19-inch multi-spoke AMG wheels as seen on the C 300. The AMG Line version has the same equipment count as the mid-level unit, adding on an AMG exterior kit. A wallbox is available for the car, and is priced at RM7,500, though a domestic plug charging cable is provided as standard. Deliveries of the C 350 e Avantgarde are slated to begin around the end of the month or early November, with the C 350 e AMG Line arriving early next year. The AMG Line variant adds on an AMG Line exterior kit on top of what’s found on the Avantgarde (with AMG Line interior), along with Artico faux leather seats, dashboard and door cards. We’ve driven the Mercedes-Benz C 350 e in San Francisco – read the review here. For a complete look at the different specifications of the C 350 e variants, visit CarBase.my. Sport rims recycled from Audi A6 Hybrid??? Thumbs up Mercedes C350e, Thumbs down BMW 330E. If these EEV cars can gip big discounts, why keli facelift & Biza & city no gip discount? 300ribu?!!! Baik beli 3 bijik Vios Sportivo. 3 Vios compare with a Merc? Shove RV down your big fat arxx. Rather than price it cheaper to take advantage of the incentive, Merc chooses to load this car with all the options like Air suspension. They should spec a below RM250k model. must have another car on standby at home always. 1. Now, I mean now, you can really get a brandnew 520i at rm288,888. 2. X3 diesel you can get a pre-reg unit at well below rm300k before Dec 2016. 3. 388k is not far from 298k. The former is far much more better. Or wait for the 7-series PHEV. so 7.5k for that extra 15 minutes quicker charge? Our valuable time is $$$. Must well just pay for the top spec to get all the kit since the price diff isn’t a lot to begin with. inb4 ironic words from 316i Owner #base spec. Is the blue plug-in hybrid sticker for display only (for the launch event) or is it permanently on the car? Good deal, especially the fact that it’s equipped with the airmatic suspension which is a big welcome in our pothole ridden roads. Tax the rich so no poblem. i have just bought a new c350e model, when the car was fully charged with 100%, the distance show with only 22km and when use Hybrid mode it only can run up to 11km. is this normal? Why put the charging bay at the backside? Put at the left of right side la. Malaysia so many tailgaters and If some idiot hit the back and spoil the charging bay. Why charging port at rear bumper? and your penny at the center bottom ? just top up a bit RM100K & better buy XC90 T8! Why buy this car when the BMW 330e is RM50k cheaper? Furthermore, in overseas pricing, the BMW 330e is more expensive than this C Plug In. So, in other words, we are lucky in Malaysia. The BMW is far cheaper in Malaysia despite being more expensive than the 350e in US and Europe. At this price, No PRE-SAFE, No DISTRONIC PLUS WITH PRE-SAFE BRAKE, No ACTIVE BLIND SPOT ASSIST and No ACTIVE LANE KEEPING ASSIST. THANK YOU MBM FOR THE ULTRA-HIGH PRICE CAR WITH 0 SAFETY SPEC!!!!!!! Unfortunately, the BMW 330e is 40k cheaper. Of course Merc can claim it is faster by 0.2 second to 100kmh & have higher output of 275 HP compare to 252 HP(BMW). IMO, if U have the $$$, any one of the above is equally desirable. Just buy what U NEED & not what U WANT. As for me, I’m happy with my old workhorse that have only 4 ratios with only 2 airbags. Happy reading & commenting folks. Quite a disappointment in terms of pricing and specs, they should have at the very least try to make the c350e priced in the mid range of the c class lineup. Time will tell how many units will be sold. Is the charge port J1772 or IEC Type 2?? Is the charger J1772 or IEC type 2? ?